PEOPLE. See that little, unasuming white tube over there? It is MAGICAL. I am afflicted with The Bags and, often times, The Puffy after late night blogging and general internet ridiculousness. Also my severe addiction to Mexican food. But YOU’LL NEVER KNOW IT. I stumbled upon this product years ago when Houston was blessed to have an Institute Clarins – the only one in the United States. Oh to stumble in those caramel colored walls washed in warm light, punches of their signature red dotting the scene. My aesthetician handed it to me and I’m fairly certain rays of white light shot out of it as glitter tumbled slowly from the sky. It is ultra-light and non-oily and works with even the most sensitive of skins. You only need the tiniest amount, so the investment in the product is worth it. You can stretch a tube for months (depending on the amount of Mexican food eaten). Try it out. 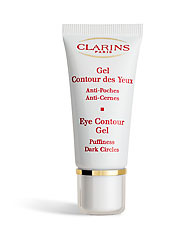 Clarins Eye Contour Gel – full of unicorn magic. Clarins did not provide any samples for editorial consideration. This information is provided because I genuinely love this product and think you deserve the best.